LONG ISLAND CITY — A group of Queens high schoolers got a visit today by the nation's highest-ranking education official. 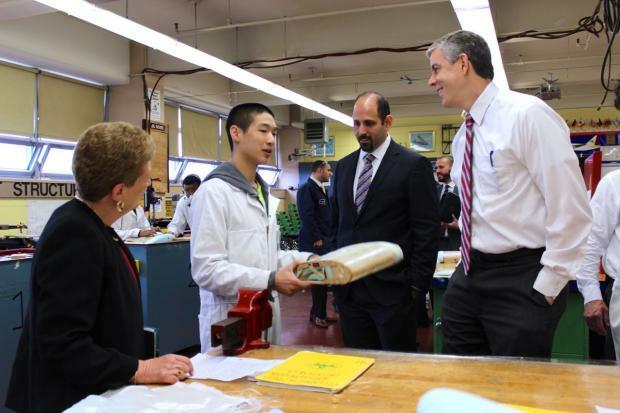 U.S. Secretary of Education Arne Duncan took a tour of Aviation High School in Long Island City, where he met with students and staff to discuss the future of vocational education and how to better prepare high school graduates for real-world careers. Aviation High School, located at 45-30 36 St., opened 80 years ago and is the largest aviation mechanics' school in the country. The school emphasizes hands-on learning, and students are taught the ins-and-outs of how to fix airplanes by practicing on 17 real aircrafts located on the school's campus. "I think this is a pretty spectacular way to learn," Duncan told students as he sat down for a panel talk in the school's full-sized aviation hanger. The education secretary also stopped in on a woodworking class where students were crafting their own wing bays. Duncan's visit to make a push for President Obama's plan to re-design America's high schools to keep up with a technology-based economy, with an extra emphasis on career-training. "So much of what we want to see replicated is what we see here," the education secretary told students. Thomas Castro, a 15-year-old Aviation High School sophomore, said it felt good to get some high-ranking recognition. "It's nice to see that we're being listened to and people are checking up on us," he said. The city's Department of Education operates 38 Career and Technical High Schools, according to its website, and the city plans to open seven more CTE high schools this fall.